Like transit agencies elsewhere, operators in the Bay Area generally show only their services (more or less) on their maps. Unlike some operators elsewhere, no single agency in the Bay Area is so omnipresent that its map can effectively function as a regional rail map, at least (if not a regional transit map), like maps for the New York City Subway, Washington, D.C. Metro, Boston T or Chicago El, among others. The detailed BART map found in stations sorta, kinda tries to. This map weights rail services (sorry, no space for buses) by frequency and capacity. 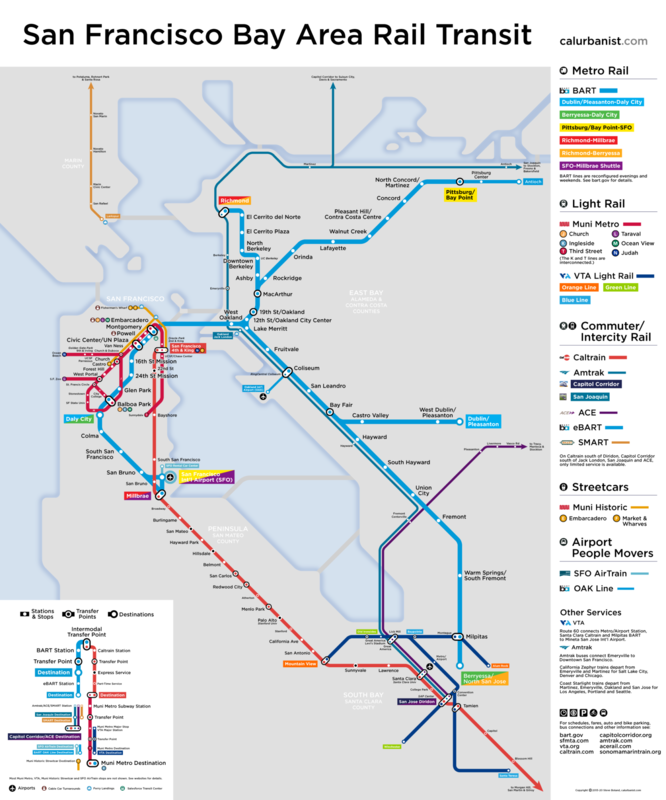 This is at least the third, maybe the fourth version of a Bay Area rail map that I’ve produced. If the goal is to balance aesthetic simplicity and legibility with geographic accuracy, while still providing as much useful information as possible — as it is for most of the maps I produce — then it’s a design challenge: The Bay Area is a sprawling region with nine separate rail operators (some operating more than one type of rail), the quality and quantity of rail service varies widely, and the network is frankly kind of a mess. The typeface is Gotham.